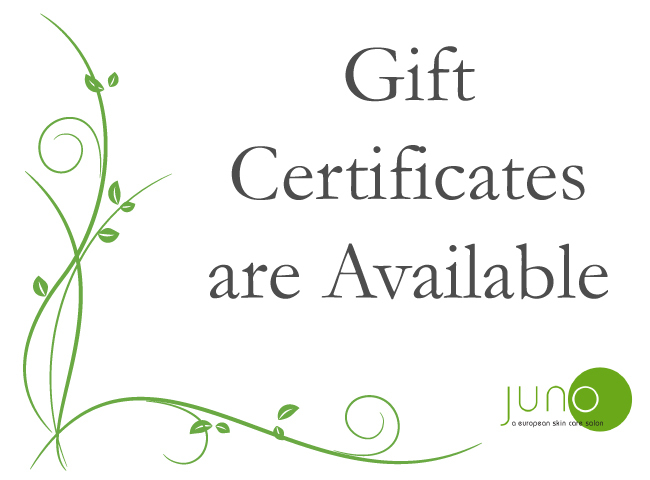 Juno Facial Treatments are designed to improve the appearance and health of the skin. Each facial begins with a consultation, wherein Ida closely examines your skin, suggests a course of treatment and answers your questions. Complimentary aromatherapy and hand treatments is included with each Signature Facial. Pineapple Enzyme Peel – Gentle thorough exfoliation without acid for a smooth, radiant, youthful look. Garden Herb – Our own unique blend of herbs to bring balance to oily and problem skin. Glycolic Smoothing – A power treatment to rapidly exfoliate skin cells to clarify the complexion and counteract sun damage. Vibran C Peel – Dramatically resurfaces skin texture to brighten dull skin and encourage collagen production. Anti-Acne Papaya Enzyme Peel – A dynamic blend of active enzymes is applied to digest debris on the skin’s surface, loosen blockages, refine pores and help with acne prone skin. Grape-Wine Peel – Natural exfoliation, provides essential nutrients and antioxidants, making this a total ‘anti-aging” treatment. Mini – Includes a custom masque and deep pore cleaning. Therapeutic Teen – A beneficial treatment of our own blend of herbs to help balance oil, control breakouts and promote the development of early habits for great skin care and hygiene. Professional Treatment for Men – Customized facial provides deep pore cleansing and toning to restore fitness and vitality. Revitalizing Back Treatment – Deep cleansing, improves skin tone and texture on back and shoulders. Face & Neck Tightening Treatment – Volcanic ash clay particles penetrate skin pores with a powerful absorbency, lessening the appearance of problem areas. European Facial Massage – Relaxing face, décolleté and upper back massage. Complimentary aromatherapy and hand treatments are included. Please notice that waxing services cannot be performed on clients who are taking Accutane, Retin-A, or other antibiotics or are sunburned or recovering from a recent laser or micodermabrasion treatment. Juno’s Signature Skin Care Products are derived from the finest ingredients formulated in the USA. France, Germany, and Poland.